Metals and alloys often exist in more than one crystal structure, the fcc and bcc structures of iron being a familiar example of such polymorphism. When metallic materials exist in an amorphous form, would a parallel 'polyamorphism' be possible? So far, polyamorphic phase transitions in the glassy state have been observed only in glasses involving directional and open, such as tetrahedral (4,5) coordination environments. 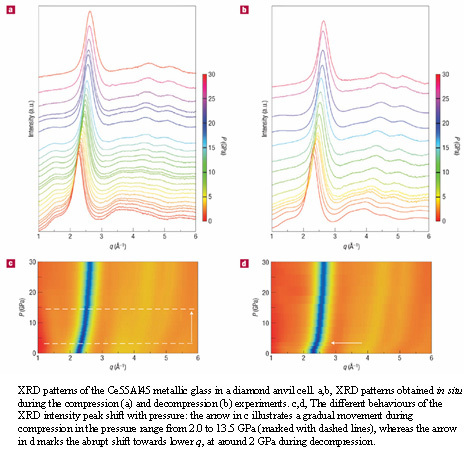 A group composed of researchers from Johns Hopkins, HPCAT, Harbin Institute of Technology, the Chinese Academy of Sciences, and APS now report the observation of a pressure-induced transition between two distinct amorphous polymorphs in a Ce55Al45 metallic glass by in-situ x-ray diffraction (Figure 1). The large density difference observed between the two polyamorphs is attributed to their different electronic and atomic structures, in particular the bond shortening revealed by ab initio modelling of the effects of f electron delocalization. This discovery offers a new perspective on the amorphous state of metals, and has implications for understanding the structure, evolution and properties of metallic glasses and related liquids. 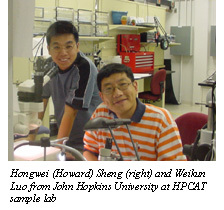 The work also opens a new avenue towards technologically useful amorphous alloys that are compositionally identical but with different thermodynamic, functional and rheological properties due to different bonding and structural characteristics [Sheng et al., Nature Materials, 6, 192-197 2007].